We run several events throughout the year, many of which are annual. Below are just a few of our regular events but please follow us on our social media accounts Twitter and Facebook for up-to-date news and events. 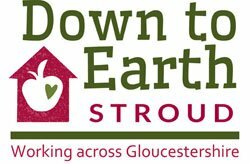 An annual event, Down to Earth Stroud have, in collaboration with Transition Stroud, organised Stroud’s own Potato Day since 2012. Potato Day is a national event which was dreamt up by Garden Organic (formerly the Henry Doubleday Research Association), and the first took place 16 years ago. Its purpose lies in a commitment to biodiversity. There are over 450 varieties of potato grown in this country but one wouldn’t necessarily think that considering what is on offer in supermarkets. Potato Day shows people this rich diversity and it also encourages more folk to grow their own. Early February we have a stall in Merrywalks where thanks to our fantastic supplier Dundry Nurseries we are able to sell the public a good variety of seed potatoes. So far the event has been very well received and proceeds of sales have helped enable Down to Earth Stroud and Transition Stroud to further other work within the community. You can see the results of recent Potato Days on our blog here. We organise fruit tree sales every year where we make quality fruit trees and soft fruit shrubs available at very affordable price. Our aim is to encourage local fruit growing and to supply information and advice on planting and looking after the trees. This is held at the Stroud Farmers’ Market which is held every Saturday 9 am-2 pm in the centre of Stroud. Dates vary. We grow a range of organic vegetable plants and native seedlings and give them away in return for a donation at our stall at the Stroud Farmers’ Market. Most plants sold in shops are imported from the Netherlands and elsewhere and we want to encourage people to grow native and organic plants where possible. We also set up a Hedging and Shrub Nursery in 2016 in addition to the growing of vegetable plants which are given away in exchange for a donation. If you have any seeds or plants which you could donate or are able to grow plants for us, please get in contact. Also since 2012 we have organised an annual Spring Gardening Event. This again is something of a collaboration with Transition Stroud. This event brings several food growing and wildlife focused organisations together in one place where they may sell their wares and/or demonstrate and talk about their work to the public. Spring is the time when people start to engage a bit more with their gardens and allotments. It’s a time of new life and seed sowing, repairing/restructuring etc. So we thought it would be great to have an annual local event where people could access some good advice and buy some of their garden supplies. So far we have had the likes of Gloucestershire Wildlife Trust, West Country Coppice, woodcraft folk, Bee Guardian Foundation and Stroud Valleys Project join us. In 2013 we held it in the Market Tavern Gardens which is perfectly situated next to the Farmers Market. It was a lovely sunny sociable day.